What is it about the fruit and vegetable stands found in markets and along the streets of every town and city in Italy that make foreigners want to fondle the merchandise? 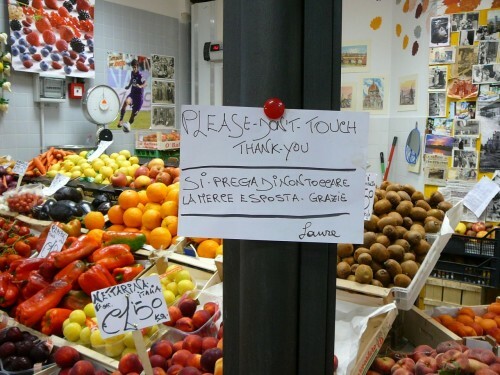 Italian Food Rule: Don’t Touch The Fruits And Vegetables. In the US everyone feels free to poke, prod, squeeze, thump and sniff the fruits and vegetables whether they plan to buy anything or not. At a produce stand in Italy that will garner you a withering look and a command to unhand the eggplant: Non tocchi le melanzane, per favore! One of the pleasures of Italy is the taste of vine-ripened (or tree-ripened) fruits and vegetables. It is the major reason Italian food is so good – fresh local ingredients at the perfect level of ripeness. They are a feast for eye as well as the stomach. This also makes the produce delicate to the touch, even if you don’t have the outsized fear of germs that most Italians have. 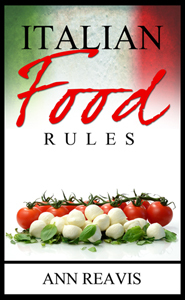 The Italian Food Rule – Don’t Touch the Fruits and Vegetables – has its basis in both the protection of the produce and the desire to reduce the spread of disease. The proper procedure is to approach a shopkeeper and say “buongiorno” followed by saying exactly what you’d like to buy. You’ll have to deal with weights and/or numbers. “Un chilo di fagiolini, per favore” – a kilo (2.2 pounds) of green beans, please; “Tre cipolle, per favore” – three onions, please; or harder still for the metrically-challenged: “Due etti di zucchine, per favore” – two hectograms (200 grams) of zucchini. It’s considered rude to tell the fruttivendola exactly which fruit she should put in your bag. She’s the expert. Locals will tell a vendor when they plan to eat their fruit and she’ll use her expertise to pick those at the appropriate stage of ripeness, especially for repeat customers she wants to keep happy. If you want ripe fruit to eat today, add clarification, “da mangiare oggi, per favore” – to eat today, please. 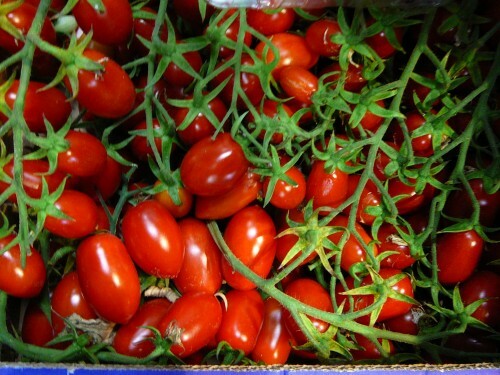 Vine-ripened tomatoes – just like candy! Sometimes a vendor will tell you to just go ahead and pick your own, or you can request permission by asking “Posso?” – may I? – and wait for a nod or the passing of a plastic or paper sack for your use. But just because you have permission to select your own potatoes, doesn’t mean they want to see you rooting through the bin tossing your rejects hither and yon. You’re expected to carefully select and touch only those items you wish to buy, unless there’s obviously something wrong with them. It’s all about hygiene. 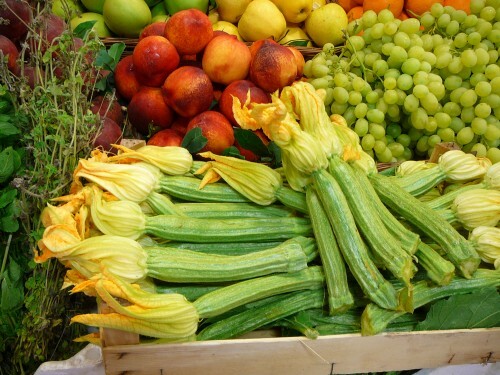 You may have the luck to find the one or two produce vendors in Italy who love foreigners and take pride in providing all of their customers, new and old, with the very best fruit and vegetables they have to offer. Do not feel bad if this is not the case on the day you are shopping for figs and plums. Your fruttivendolo may not have your best interests at heart. It most likely has less to do with the fact that you don’t speak Italian with the local accent as it has to do with you are not a regular customer and he has produce he need to offload. My most memorable experience was the day I wanted to buy three large fresh porcini mushrooms. 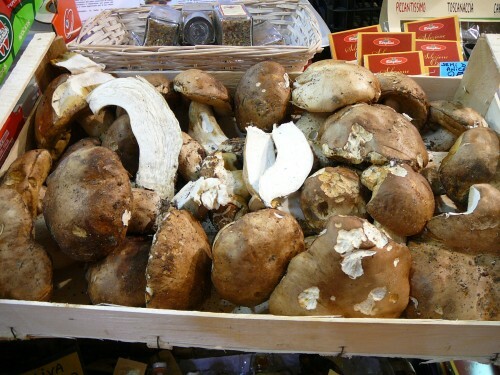 I went to a stand in Florence’s Mercato Centrale where the vendor only sold mushrooms – the expert. There was even an example of his high quality ‘shrooms split in half exposing its firm white worm-free center. I followed the Italian Food Rule – Don’t Touch the Produce. I asked for three large porcini with stems and caps. He selected three fine looking specimens and placed them carefully in a paper bag. I trudged home with my sacks of shopping, unloaded them on the table and discovered that one of my fine mushrooms had a toothpick holding the cap to the stem and was turning slightly brown at the center. But there were no worms. Also, in the Mercato Centrale is a lady that has the largest, most beautiful stand of fruits and vegetables. Years ago I bought a bag of apricots from her. Before she had finished giving me change the bottom of the bag was soaked with juice. I showed her the bag and ask for another selection because clearly at least one apricot was over-ripe, spoiled or damaged. She proceeded to yell at me and refused to replace the fruit. For the next five years I brought my touring clients to her stand and explained that it was a Kodak moment, but that they should never consider buying her produce that was beautiful to the eye but rotten to the core. Florentine Francesca does not get a free pass to produce perfection. She has been the recipient of blue mold on lemons, rock-hard plums (“mature e perfette,” said the vendor), limp green beans, and worms in porcini mushrooms (though at this Francesca declared it was a protein bonus). Buying groceries at an Italian supermarket is easier. You get to touch the produce. But not with your bare hands. At Coop or Esselunga or Conad, it won’t be the vendor upholding the Italian Food Rule: Don’t Touch the Fruits and Vegetables. 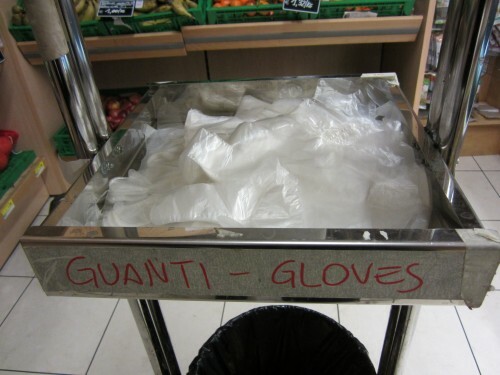 It will be Italian housewives, young to very old, enforcing a subset of the rule – Don’t touch the produce without a plastic glove. A withering look from an Italian grandmother is just scary. A sarcastic comment is even more frightening. 1) Find a plastic glove; 2) Put it on; 3) Get a plastic bag for each of your desired fruits or vegetables; 4) Select your produce from the bins; 5) Look for and remember the code on the bin’s label; 6) Place your bag on the nearby scale and push the button that corresponds to the code; and 7) Wait for a printed sticker to exit the scale and paste it on outside of the bag. If you don’t follow this procedure, the checker will have to do it for you when you check out (or worse, will send you back to do it), much to the displeasure of the people in the line behind you. 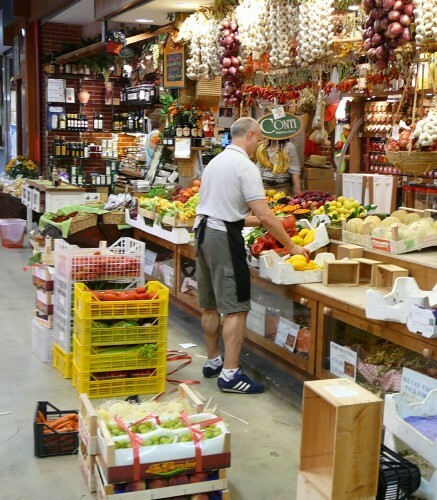 One of the pleasures of living in Italy is shopping at the food markets. 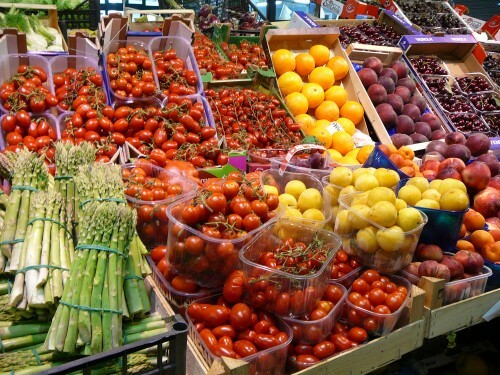 The produce is necessarily fresher than at the supermarket that stocks in massive quantities. The ideas that come to mind when discovering what looks best at the market on a given day enlivens your dinner menu. Savoring the perfect cherry, peach or fig can almost transport you out of the crowded city to a sunny orchard. But to enjoy all of this and follow the Italian Food Rule: Don’t Touch the Fruits and Vegetables, you must by trial and error, with good humor, find an ortolana who treats you right and then get to know her, asking her advice about what to buy and how to cook it, greeting her even when not shopping for produce. It is a relationship that can last seemingly a lifetime and can save you from finding toothpicks in your porcini.